Oofta, it's been quite a while since I posted anything new. It's so easy to get caught up in the fast pace of Korea. Time flies here--I've been here just over six months, but it feels like I've only been here for two weeks. I hate to employ such a cliche, but time flies when you're having fun, I guess. A few weeks ago, I went on a fantastic trip with a group called When in Korea, or WinK for short. One of the things we did in our action-packed weekend was hike Mt. Wolchulsan to watch the sunrise from the cloud bridge. 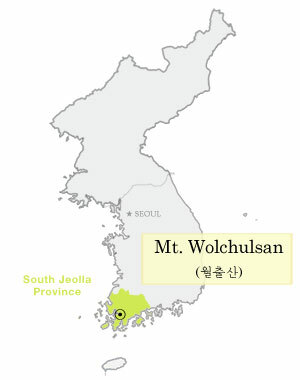 The name Wolchulsan means "mountain where the moon rises". Below is where it's located on a map of Korea--for reference, I'm located much farther north, a tiny bit south of Seoul. It was quite a long bus ride. The hike was absolutely beautiful. I almost went all the way to the cloud bridge, but my fear of heights kicked in and I decided the cloud bridge would probably not be the best thing. We did catch the sunrise from a pretty nice height, though. It was about five in the morning when we arrived at the park. It was completely dark, which made the hike a bit treacherous. It was an interesting journey, including giant boulders, a few tiny waterfalls, and tons of stairs. It was an absolutely gorgeous walking up, and it was fantastic to see the sun slowly rising and illuminating the path. View of Wolchulsan from the entrance. The fantastic thing about not staying at the top for the sunrise is that we had a bit of extra time before the rest of the people walked back down. We discovered a park filled with statues on the way down, and stopped to take tons of pictures. The initial road leading up the mountain. I absolutely love seeing these around. Stone piles have a particular meaning in Buddhism. They are quite common in spiritual places. There are usually small, round stones on the bottom that decrease in size as they go up. They usually represent Buddhist prayers, or people make them with a wish in mind. I saw many of them at Seonamsa, a Buddhist temple I visited, and they seem to be quite common near mountains as well.